Are you looking for ways to reach new customers and/or reconnect with your existing ones? Whether you’re a small business owner, an account manager at an agency handling many clients, or even if you manage marketing for a large brand, you probably know that photo contests, can increase engagement with your customers and bring traffic to your website. But did you know they can also help you build segmented email lists, and learn more about the kinds products your existing customers want in the future? To help you plan a successful photo contest, use this eight-step guide which includes everything you need to know about how to launch a photo contest that’ll both increase engagement and give you leads to use throughout the year. 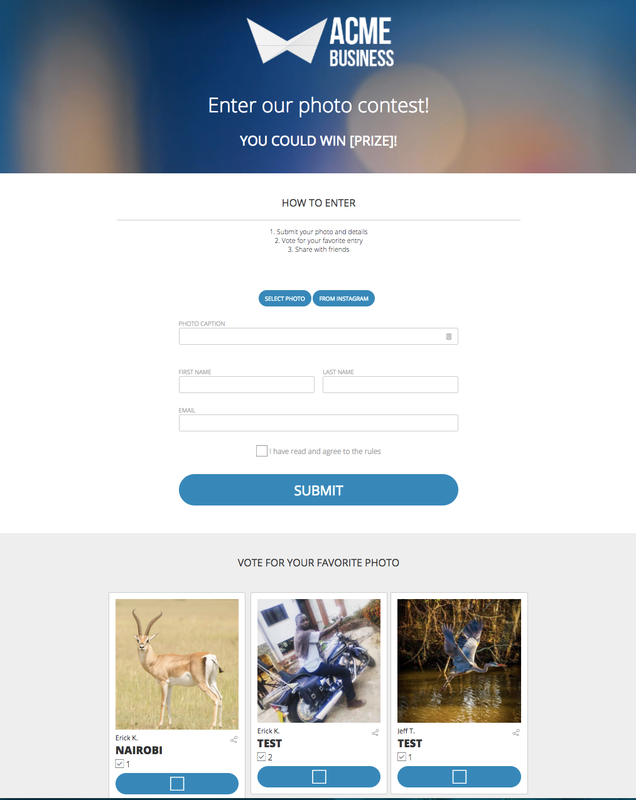 To make things even easier, use one of our free, customizable photo contest templates. To access these templates, and 35 others, just set up a free ShortStack account. Ready to create and launch a photo contest? Before you create your contest, decide what you want to achieve. Once you’ve decided on your big-picture goals, set smaller, SMART goals — goals that are specific, measurable, attainable, relevant, and timely. Why? The more specific you are, the easier it will be to gauge whether your goals have been met. 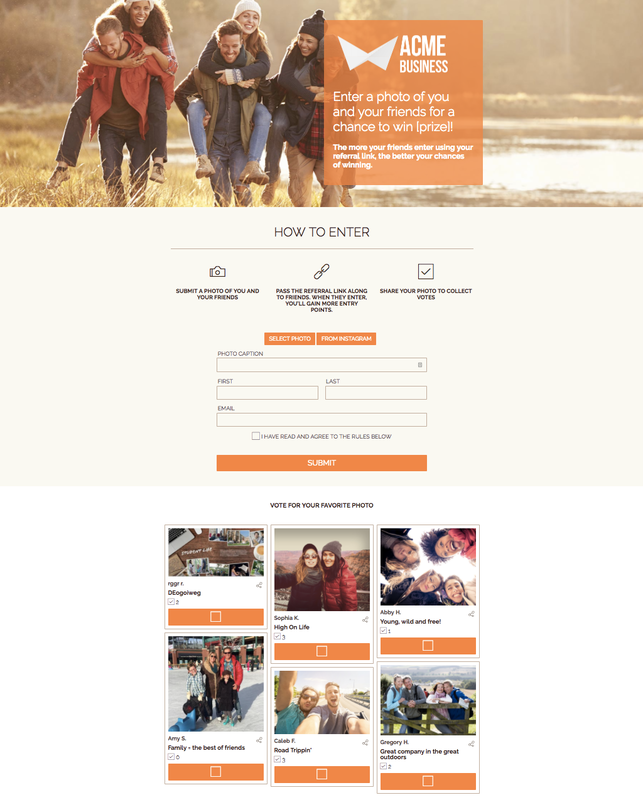 Use a basic photo contest to collect 100 pieces of user-generated content (UGC). Use a refer-a-friend photo contest (and reward every person who enters your contest with extra entries when they share your contest with a friend) to collect 1000 email addresses from new customers. Use an enter-to-vote contest to determine which product(s) your existing customers are most likely to purchase from you in the future. The prize you plan your photo contest around is key. The prize could be your product or service, or a product or service that is relevant to your brand. Spend some time thinking about what kind of prize will attract your ideal customer. Be audience-specific. One of the biggest mistakes companies make is hosting a generic “win an iPad” giveaway. You might gets lots of entries, but they won’t necessarily be your target audience. For more tips on choosing the right prize, check out this guide. Give away several “inexpensive” prizes. We’ve seen companies get lots of attention by offering a prize like the chance to test-drive a car, taste-test a new food, or take a cooking lesson from a famous chef. Choose the type of photo contest you want to host. Edit the template — logo, images, form fields, etc. — to reflect your brand. You can even create designer-quality images for your contests without needing graphic design skills. We’ve written extensively about what to include in social media contest rules, and even have a template that outlines everything you need to consider. The success of your contest depends on how you promote it. If you’re giving away a trip to Paris or VIP access to a Taylor Swift concert, word will get around and your contest will get plenty of attention. If your prize is more modest, you’ll need to create a comprehensive promo plan. Install a website header notification bar; we use Hello Bar. Post a link to your contest on Facebook, Twitter, Instagram, Google+, etc. Pay for some advertising on Facebook, Twitter, YouTube, Google Adwords, etc. List your offer on giveaway sites — this blog post has an extensive list of options. Embed your contest on your website so that you leverage your existing website visitors. Once everything is in place — you’ve established your goals, created your offer, designed your promotion plan (and have all the images, ads and posts created or in the pipeline) — you’re ready to launch. Make sure you have someone who isn’t too close to the project test your contest for you, including having them fill out forms. If you built your contest with ShortStack you can be sure it’s already mobile-ready but if you used any other platform you’ll want to test the contest on mobile devices, too, since we know mobile is increasingly how people access pretty much everything on the internet. Email autoresponders let you contact everyone who has entered your contest instantly. Since ShortStack added this feature to our platform in November 2016, our users have had a 46.9 percent open rate (a phenomenal number when you consider that the average email open rate is about 25 percent!). Email autoresponders let you personalize any follow-up communication you have with people who enter your contest. You can even send them special announcements or offers after your contest ends. What happens after your contest is over is just as important as the actions you take before and during. Measuring and analyzing the data you collect are two of the most important steps in this process (leveraging the data, which we cover in the final step, is another one). Once you’ve collected leads, you’ll want to make them as useful as possible. First, eliminate low-quality leads from your list. Delete email addresses from people who didn’t confirm their email address and/or giveaway confirmation emails. You don’t want these email addresses anyway since they’re probably fake accounts or otherwise not valuable to you. Next, segment your new list. A properly segmented list is a profitable list. Now that your contest is over and you’ve reduced your email list to only the most active and qualified leads, it’s time to segment the list. Each business has different segmentation filters that benefit them the most. Some filters include age, gender, industry, their relationship to your business (are they already a customer of yours, or are they on another one of your other email lists? ), etc. Geography is another popular filter. Many international clothing companies, as just one example, find that segmenting their list by zip code is crucial. If they don’t take the time to do this, they could end up sending messages promoting their new summer apparel to people who live in Australia. Once you know how you want to segment your list, you’ll be prepared to craft different types of messaging. This is the beauty of segmenting your lists. The more personalized and refined your future messaging to your giveaway entrants is, the more effective your messages will be. Then, share a relevant offer. After giving people a resource, or a chance to win something special from your brand, give them even more. When your contests ends, consider sharing an exclusive, just-for-those-who-entered offer. And be sure to customize it to appeal to your entrants. As you plan out next year’s marketing efforts, look for ways to leverage the data you’ve collected during the holidays. Look at your lead data through an analytical lens. The amount and the quality of the data you’ve collected can help you fine-tune future contests and other promotions you run. 1.As a conversation starter. One of the best examples we’ve seen of a company that kept the conversation going through the data they collected from a promotion was when loan servicer, Great Lakes, used a Facebook giveaway to help their customers learn more about student loan borrowing. Great Lakes promotion featured a quiz with five questions relating to student loans. Fans were not required to take the quiz in order to enter the promotion, but the educational questions combined with the fact that everyone loves a quiz, attracted their entrants to participate. While Great Lakes grand prize was a big one — a $6,000 payment towards a student loan — they closely monitored their quiz answers and used that to craft their social media and email marketing messages to their followers. They were even able to provide resources to help address the questions they were seeing from their followers. 2. To offer something exclusive to your new fans and followers. Even though email marketing is still a majorly successful communication tactic, people are still inundated with emails every day, and marketers still need to find a way to stand out in the crowd. Exclusivity is a great way to incentivize your entrants and to get a little more out of your fans than you previously would have. Let’s say you’re a small business that ran a promotion where you asked fans to provide their email address in exchange for a chance to win a prize. You include a link that suggests they subscribe to your email list….which one sounds better? Subscribe to our email list and receive a free gift! Obviously receiving a free gift is much more enticing than simply subscribing. Exclusivity instills excitement for your product, and excitement for your product builds brand loyalty. Loyal fans means loyal customers! If you want to learn more, here are seven other ways to leverage the data you’ve collected from your customers. If you have any questions about using ShortStack to create a photo contest, shoot us an email: theteam@shortstacklab.com.